Safety Capacitor, 보통 X,Y Capacitor로 부르며, 안전을 위해 AC 전원 라인에 사용되고, X, Y 2가지 타입이 있다. 일반적으로 X2, Y2를 많이 사용한다. When a Class-X capacitor, also referred to as an “across the line capacitor”—the capacitor placed between line and neutral—fails because of an overvoltage event, it is likely to fail short. This failure, in turn, would cause an overcurrent protective device, like a fuse or circuit breaker, to open. Therefore, a capacitor failing in this fashion would not cause any electrical shock hazards. 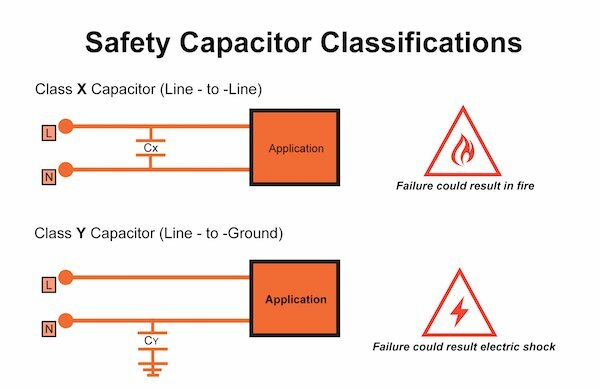 If a Class-Y capacitor, also known as the “line to ground capacitor” or “the line bypass capacitor”—the capacitor placed between line and ground—fails short, this could lead to a fatal electric shock due to the loss of the ground connection. Class-Y safety capacitors are designed to fail open. A failure will cause your electronic device to be subjected to the noise and interference that the capacitor would normally filter out, but at least there will be no fatal electric shock hazard.